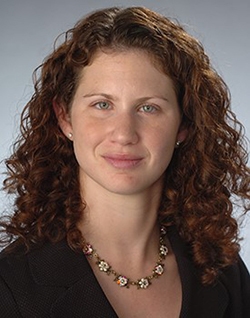 Shana Kushner Gadarian, assistant professor of political science in the Maxwell School, has won the 2015 Daniel Patrick Moynihan Award for Teaching and Research, which recognizes an outstanding junior faculty member for excellence in teaching, research and service. Gadarian’s primary research interests are in American politics, political psychology and political communication. In particular, she is interested in how citizens learn and form attitudes when politics is threatening—whether threats come from terrorism, infectious disease outbreaks, or media and elite rhetoric. Her work is developed in a forthcoming co-authored book, “Anxious Politics: Democratic Citizenship in a Threatening World,” which explores the effects on Americans of anxiety over policy issues like immigration, public health, terrorism and climate change. Gadarian is also at work on a collaborative project with Rene Almeling from Yale on how genetic risk information shapes Americans’ beliefs and attitudes about disease, family and responsibility. Her research has been funded by the National Science Foundation, Robert Wood Johnson Foundation, Princeton Policy Research Institute for the Region and the Bobst Center for Peace and Justice. Her work has been published in the American Journal of Political Science, Journal of Politics, Political Psychology, Political Communication, Perspectives on Politics and others. Gadarian received a PhD in politics from Princeton University in 2008 and was a Robert Wood Johnson Scholar in Health Policy Research at UC-Berkeley.